We welcome your inquiries & will respond within 24 hours. The apartment is located on one of the most charming streets of the Artist's Quarter of TRASTEVERE. Here you will stay near all of the most important tourist points of interest. You can REACH ALL THIS POINT BY FEET. This area prohibits vehicular traffic, making it possible to walk till late at night between the alleys safely. 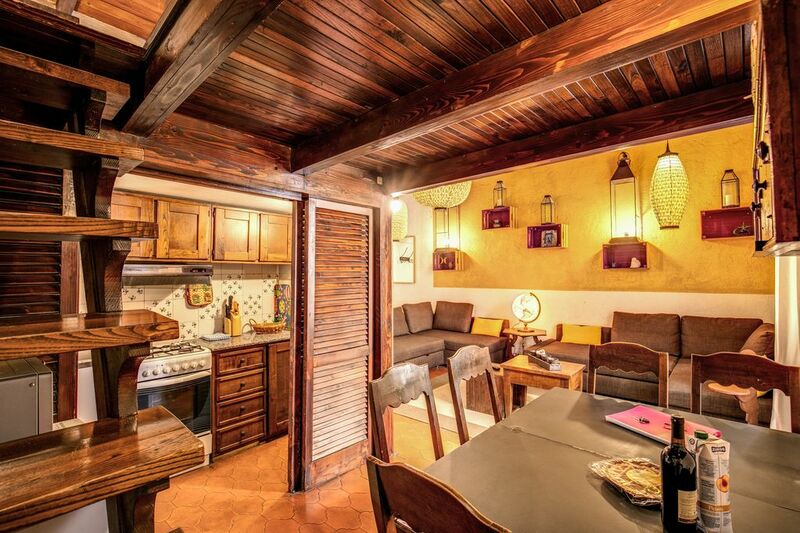 This apartment is located exactly on Via della scala, 6 . The whole neighbourhood is filled with shops, restaurants, pubs and pizzeria, which makes this a perfect area to go out at any time of the day or the night. Trastevere seems to have a special magnet that attracts people from all over the world, and is the favourite Roman Quarter for artists, musicians, actors and people who seek something new. Its colourful personality never leaves you untouched. The Roman Forum, Coliseum, Pantheon, Piazza Navona and more sites are all within walking distance. As for public transportation, a few steps from home, you can take a small electric buses to run all historical center. This apartment consists of a large comfortable living room where you can find two double sofa beds and TV. A small kitchen is separate and enclosed by two wooden doors that can be closed if necessary. It's complete with stove, microwave, refrigerator and all the accessories needed for cooking. In front of the kitchen there is a table with 6 chairs for eating and a staircase leading to the loft where there is a wardrobe and a comfortable double bed. A full bathroom with shower and washing machine. TRANSPORTATION FROM THE AIRPORT: A private limousine service can be arranged at the time of booking. Price around 15 euros per person. PERSONAL CONCIERGE SERVICE: Upon arrival you will be met by Mr Filippo who will provide you with keys, maps, and general orientation. Special requests can also be satisfied. Cleaning service can be arranged for an hourly rate. My english language it’s not very good expecially by phone. Email is best! The apartment is located in one of the most charming streets of the artistic neighborhood of Trastevere. Guests will stay close to all major tourist attractions. You can reach ALL MAJOR POINTS OF INTEREST BY FEET. This area is closed to vehicular traffic, it allows you to walk until late at night in the narrow streets without any kind of danger. This apartment is located in Via Garibaldi a very quiet street and rich in the heart of liveliest neighborhood of Rome. The entire neighborhood is full of shops, restaurants, pubs and pizzeria, which makes the perfect area to go out at any time of day or night. Trastevere seems to have a special magnet that attracts people from all over the world, and is the favorite Roman Quarter for artists, musicians, actors and people who seek something new. Its colorful personality never leaves you indifferent. As for public transport, walking distance from home, you can take a small electric buses to run all the historical center. The apartment is located in one of the most charming streets of the artistic neighborhood of Trastevere. Guests will stay close to all major tourist attractions. You can reach ALL MAJOR POINTS OF INTEREST BY FEET. This area is closed to vehicular traffic, it allows you to walk until late at night in the narrow streets without any kind of danger. This apartment is located in Via Garibaldi a very quiet street and rich in the heart of liveliest neighborhood of Rome. The entire neighborhood is full of shops, restaurants, pubs and pizzeria, which makes the perfect area to go out at any time of day or night. Trastevere seems to have a special magnet that attracts people from all over the world, and is the favorite Roman Quarter for artists, musicians, actors and people who seek something new. Its colorful personality never leaves you indifferent. As for public transport, walking distance from home, you can take a small electric buses to run all the historical center. 1) TOURIST TAX of the CITY of ROME : As of 01/09/2014, anyone staying in any accommodation in Rome is required to pay an overnight tax of 3,5 euro per person for a maximum of 10 days. Children under 10 years are exempt from payment. The payment to the TURISTIC ROME admnistration, will be made on your arrival to the apartment 2) NUMBER OF GUEST: the apartment must be occupied by the number of people indicated in the Reservation Form. If you wish to change the number of guest in the apartment, please notify us in this sense before your arrival so we shall inform you of any applicable price difference. Failure to respect these terms will be a cause for termination off this rental agreement and you will have to vacate the apartment immediately. 3) CANCELLATION POLICY: Any cancellation requested by the Renter within more than 30 days from the date of rental will be assessed a cancellation penalty of 50% of the amount already paid. Cancellations requested within 30 days from the date of rental will be assessed a penalty of 100% of the amount already paid. Cancellation notices must be sent to the email address myapartmentstorent@gmail.com . It will be at the renter discretion to refund part, or all, of the amount prepaid in case the apartment can be rented for the same period. Any eventual dispute will be settled in the Court of Rome 4) CANCELLATION by the OWNER: in the event the apartment is not available because of circumstances beyond our control, we shall seek to offer you another apartment with the same caracteristics. In the case you do not find this acceptable we shall refund you the entire amount paid up to the date.